One of the most long-wearing concealers, though with some cons. 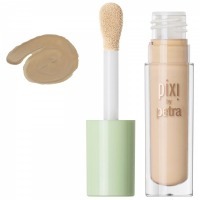 I adore the PIXI brand and I’ve got a lot of makeup from them. This concealer has become one of the follow-up buys of mine but it hasn’t become my favorite. And today I’ll tell you why. - First of all, I don’t like this huge and shaggy applicator. In my book, it picks up too much of the product all the time and I always have my clothes stained with it. This feature seemed to be interesting at first but they failed with the performance. To the advantages, I can list the shade line-up of the brand. There are a lot of fair shades and I appreciate that the formula doesn’t oxidize over time. I think that every one of you at least once in your life has faced the situation when you applied your concealer and saw two orange circles under your eyes within a few hours. If you don’t understand what I’m talking about, then you’re really a lucky one! Also, I want to list the staying power to the advantages. I have to say that this is one of the most long-wearing concealers that I’ve ever had. It even stays when I’m wearing my makeup for 8-10 hours when my foundation has already flaked off and my makeup looks messy, I can still detect fair patches under my eyes, which make me think that the concealer is still there and it doesn't even want to leave my skin. This fact is followed by a disadvantage, which makes me believe that I’m very unlikely to repurchase it. This is all due to that crazy staying power, which makes the formula too dry and harsh for my under eye area. My skin isn’t problematic and I don’t have much to conceal. So the only area where I use it is only over the dark circles. But my gentle eye area doesn’t wanna make friends with this concealer. Hence, it’s very unlikely that I'll repurchase. In all other respects, I have nothing to be picky about. It’ll be fine for concealing skin blemishes and I know that it’ll stay on for a long time. This is very subjective, but if I am to rely on my own experience only, I’ll give it 4 stars all in all. Hello there! I bought this concealer from an e-shop for $16. I have it in the fairest shade #01 cream. And here I want to tell you that, this fairest shade from the line-up, won’t still be good for those Snow White skinned. The consistency of the product is thick. Objectively, it’s a good eyeshadow primer… But I didn’t fall for it!